Step 1: Generate Hangeul characters using Kboard by yourself and listen pronunciations. 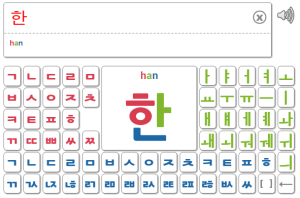 Generate Hangeul characters by combining Korean consonants and vowels using Kboard. Listen standard pronunciations for characters you generate. You will easily learn the combination rules of Korean characters and their pronunciations. ⇨ Practice repeatedly at least 30 minutes (at least 50 words) per day. Step 2: Please read Korean sentences loudly. In general, Korean pronunciations are difficult for English speakers. BUT, you can learn pronunciations easily through Kmaru [Conversation]. Read given sentences several times loudly using pronunciation guides written in English. Focus on contour as well. ⇨ Practice repeatedly at least 30 minutes (at least 10 pages) per day. Step 3: Listen Korean sentences and study correct meanings. Listen standard pronunciations for given sentences (click character icon or each word). Study meanings of words and expressions in [Vocabulary] and listen standard pronunciations. ⇨ Practice at least 30 minutes (at least 10 pages) per day. 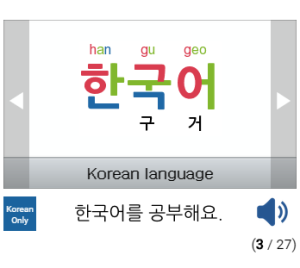 Step 4: Analyze Korean words. It’s important to know the usages of Korean particles and endings. Read contents in [Deep] and study Korean grammar (or click each word).